Painted my remaining Volks Neo Go 3 head. It's a rather effeminate sculpt, so the challenge was to avoid making him look *too* girly. 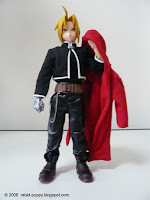 When it comes to 1/6-scale clothing, you can't go wrong with Azone. 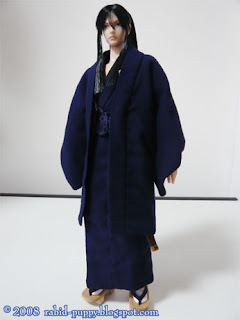 I bought this navy men's kimono set intending to customize a samurai ages ago, when I ordered my first batch of heads from Volks. 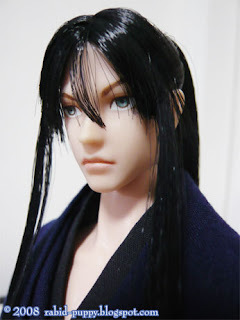 At the suggestion of my boyfriend and my sister, I painted this head to look like Kanda Yuu from D.Gray-Man. Can't say I'm a fan of the character or the series yet, only watched a couple of episodes so far. 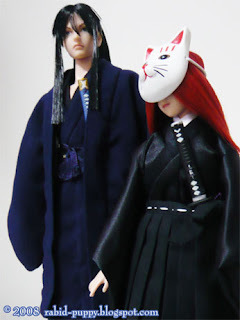 Also, the Volks red-head has swapped bodies. 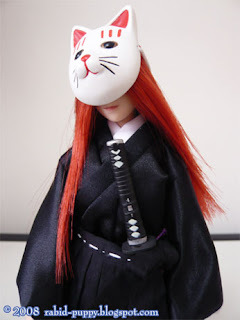 She's been dressed to resemble the Shinigami/Vizard from Bleach, complete with a 1/6 mask. I'll repaint the mask to look less cheerful, lol. It's probably time for me to get new paintbrushes. Does anyone know any alternative to Volks' paintbrushes? I've tried brushes I bought from art stores, but none have been good enough. EDIT: I've uploaded new photos after Nat pointed out my noobish mistake, lol! Thanks again Nat! No bobble head! XD His head's not on all the way! Ya gotta squeeze that thing and push it on so that the thick square base of the neck prong is inside the head. Don't you just love Azone clothes? :3 They both look cool, but I might be biased. D-Gray Man is a great series, but I don't really care for Kanda's personality. But you should watch it. He is a cool swordsman so the look suits your guy. Nice samurai, love his hairstyle. And did you make the mask too? Thanks Sket. 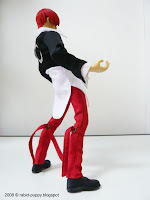 Most male custom Japanese dolls fall under this category, and I was trying to buck the trend, lol! Gotta try harder! 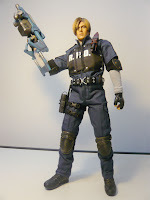 Looks awesome, at first glimpse I thought it was a real person, the details are nice. I have a splitting headache!! - Sometimes it might not be too bad! No. 12 – Custom Zombie Heads by Gabriel Garcia & Jorge Perez - 2013 was a big zombie-year for me. I did ten custom zombies using the excellent head sculpts made by Gabriel Garcia & Jorge Perez. All original photo and text content copyright 2009 Michelle L. Please do not reproduce without permission. Gracias!